Feedback on dancing and ceilidhs at Sidmouth Folk Week 2005 - and planning for Sidmouth Folk Week 2006. Monsoons were predicted over East Devon in the days before Folk Week in 2005. Birmingham was hit by a mini tornado. 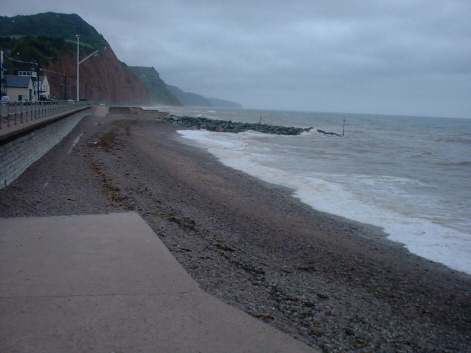 There was some heavy rain in Sidmouth on 27 July (Wed) but only a little overnight. 28 July was simply overcast. Overall, Sidmouth escaped the worst of what was forecast but the campsite at Bulverton was prepared in atrocious weather over 23/24 July. The festival started under dull grey skies but on Tuesday and Wednesday there was glorious sunshine. The only downpour was on Thursday night (which didn't prevent a good turnout for the Whapweasel LNE). By Friday the Esplanade was packed once again and the campsite had dried out. The main Blackmore Gardens ceilidh marquee. One of the small ends of the Ham marquee. The dance floor alone was 65' by 50'! It was a superb facility. The Crafts Marquee at Blackmore Gardens. Already thoroughly tested against the ingress of water......it later proved very popular. Caravanning at Sidmouth would not be the same without problems at the entrance to the Bulverton site. A free advert for the Stone Shop of Maidstone. Gordon Newton arguably did more than anyone else to ensure that Sidmouth Folk Week succeeded. 27 July: Latest news is that there are so many events in the official programme, people are starting to ask how many attendees there may be at some of them! Of particular concern is the very late introduction of some attractive and cheap (� events starting at 8 pm at Bulverton in the marquee organised by Gordon Newton. These compete (for example) with the ceilidhs organised for 8 pm in Blackmore Gardens - and if I had put time and effort into those I might be annoyed by the late addition of arguably more attractive and cheaper competition. All of this serves to emphasise that next year there should be a centrally organised festival with a season ticket offering flexible admission - so you don't have to decide in advance what to buy. However, there is apparently one reason why this may not happen, quite apart from the attraction to one or two organisers of continuing to host some of the most 'secure' events in terms of making money, and keeping these as private ventures. I am told that the licence fee for venues for less than 1000 people is only �0 - this apparently applied to the LNE at Bulverton and to the Ham marquee. However, if the whole festival was to be run as one event then the fee for a single 'large event' licence could be many times greater than for many licences for small events. If this is indeed true, it is an example of how government mismanagement is making life as financially difficult as possible for the types of folk festivals that are most attractive to attendees - those where ticket arrangements are the simplest (and best value) because they are administered centrally. And who said this country didn't support the Arts?? More later! And if I find out that THAT WOMAN Tessa Jowell (see the opening page of SeeRed) has anything to do with it, I shall be reproducing and updating Press articles that have already castigated her as the person whose Department seems set to destroy the financial viability of major street carnivals in the UK - an article in the Sunday Telegraph 10 April 2005 covered this in some detail. It may (I hope) now be out of date. Tentative plans to run Arena events under the cover of a huge 'open sided' marquee in 2006 have not gone down well with some local folkies - part of the attraction of the arrangements under Steve Heap being apparently the open air and (maybe) sunshine. Who would be a festival organiser? 28 July. Sidmouth's new secret weapon against seagulls is deployed. A gale force wind made them seek shelter at the foot of the cliffs. People sought the comfort of a pub or shop, from where they were unable to throw chips to the birds. These have become a nuisance only because of the behaviour of stupid humans. Sign of the times? A Folk Week board on the A3052. EDDC plant the area as a part of Britain in Bloom. The sign blew down and was not repaired. Two residents, one a lady, spotted an EDDC workman deadheading the flowers. She asked if he could help them. "NO" came the gruff reply. She then asked if he could help with loan of a couple of tools from his council vehicle. Again, and without looking up, "NO". So the sign was left until the residents brought their own tools. It says it all I suppose, about EDDC's sense of priorities! The weather midweek and on the last day (5 August) was very good. Holiday makers mingled with folkies and the only problems were drink-related later in the evening. The alcohol ban along the Esplanade is routinely ignored. Police cars raced to yet another stabbing incident in the town, but the procession and torch ceremony were unaffected. 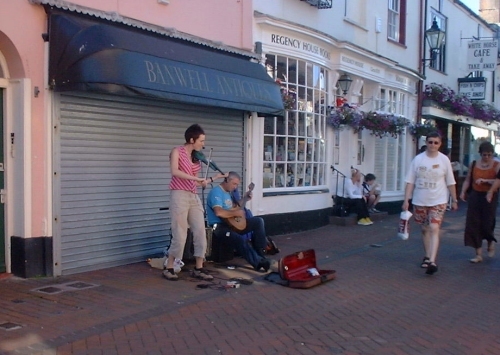 Buskers were particularly welcomed by many people in 2005 - they added colour and localised sound to what could have been dull areas of the town. These two seemed amongst the more popular, strategically located near the White Horse fish and chip shop! Shown from the path leading up to the Bulverton marquee, the main campsite is bathed in sunshine on the last day. The first field was fully utilised, and with many caravans on the larger field also. Hundreds of people came - but many more did not. The 'prim and proper' Woolbrook estate shown beyond the campsite is home to several festival detractors. The LNE marquee at Bulverton. Looking forlorn and empty at 6 pm on the last day, this probably ran at a loss (see below for analysis). It was also the subject of complaints about noise. Takings could have been even lower had the weather been less kind. This expensive and under-utilised venue may not feature in the 2006 programme - but the spirit of packed LNEs during the Steve Heap years has already been lost. Ceilidhs and dances at Sidmouth 2005. These are jottings from my own experiences. The organisers recognise that the principal change needed for 2006 is introduction of season tickets. Many people were acutely annoyed by the high cost and inflexibility of arrangements in 2005. We all understand why it had to be like this, once, but the structure must change for next year, if only because many people simply will not bother to attend in 2006 if the ticket structure is a re-run of 2005. The large fund of goodwill towards Folk Week in 2005 is not sustainable in the long term. If it is to develop into a sustainable form as a sizeable week of events, Sidmouth Folk Week will need to compete for custom with many other well developed and successful festivals - and it could already learn a few lessons from them. Leaving aside value for money and convenience, it is the flexibility of being able to 'dip in and out' of events that is the most valued aspect of a season ticket. Many people do not want to attend concerts all way through, and if you turn up at a dance and find no-one to dance with (see below) you can always try something else at no extra cost. This flexibility has been built into so many folk festivals in the UK that Sidmouth simply cannot try to be different and hope to succeed. One year of the 2005 arrangements is one year too many! 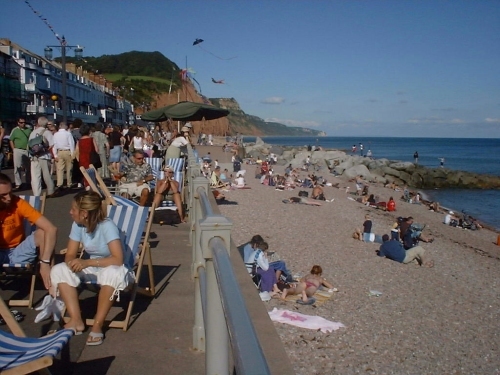 As a town, Sidmouth is ideal as a base for 'sessions' in pubs and combined with a summer break. It is less ideal for dances, having no centrally located large halls. Sidmouth College offers one possible venue for the future - both the main dining hall and sports hall could provide dance spaces at lower cost than town centre marquees. This is further discussed below and in comparing Sidmouth with other festivals. Ceilidhs and dances: initial impressions. The ceilidh on the first Friday evening with locally based Red Shed provided a promising start to a week of dancing - and on a superb floor at the Ham - full marks to Gordon Newton for that! Numbers dwindled towards the end, perhaps because the music was not the best for dancing. The Tribute to Dancing England on the Saturday managed to be especially tedious despite the quality of some of the performances and the amount of artistic preparation that had obviously gone into it. Three hours sitting down often waiting for something to watch was simply too long. If it had been a hotter evening the marquee would have been unbearable. Random provided a shortened ceilidh but (to my taste) the music simply didn't make you want to dance. Some people liked it, many left muttering about the length of the first half (two thirds) of the evening. The Social Dancing in village halls soon proved well organised and popular and with an excellent range of bands and 'big name' callers. However, these events attracted almost exclusively middle-aged and older couples with little or no scope for single people or youngsters to participate. As such, the events were a success in themselves (with queues down the road in some cases) but they added so little to the 'Sidmouth atmosphere' that they might as well have been held 200 rather than 2 miles out of town. If these dances had been held in town marquees, with room for more people and with the same range of bands and callers, many 'ceilidh' dancers would also have attended and the whole 'in-town' festival atmosphere would have been enhanced. A press article proclaiming the success of these events is here. Unlike at many American style dances, there was no encouragement to change partners, thus giving single people (and especially ladies) some chance of a dance. A few left in despair half way through - such a contrast to the hugely successful American style evenings at Chippenham festival which really felt like festival dances rather than village hall dances, despite being held in similar (if larger) premises. Sidmouth 2006 could learn a lot from how Chippenham works - but Sidmouth does not have the 'ready made' venues used by Chippenham, and all within easy walking distance. One problem with the main Sidford and St Frances dance venues was that travel between them by bus was tedious - I am told you needed either to go most of the way around the circular route or use a service bus that was even more expensive. Many people used cars and offered lifts - but it was all so divorced from the main festival in town. In the view of many dancers (both inclined towards social dance or ceilidhs), the biggest single change needed in 2006 (apart from season tickets!) is to have the social dance as an integral and properly integrated part of the main programme. If the Ham is once again provided with a superb large floor, that could host social dances the equal of those at any festival - but the most cost effective use of the Ham in the afternoons and evenings is probably packing 800+ people in for a major concert! However, some social dancers who wished no part of the wider festival were quite happy with the village hall locations. 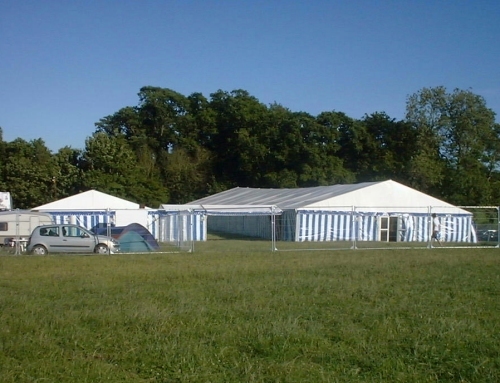 As an expensive resource, the Blackmore Gardens marquee was under-utilised in 2005. The first LNE event featured the Bismarcks with a young caller, Cat Kelly. They were on top form and provided excellent dance music - and she was simply fantastic! It was just a pity that the dance floor was so slippery that many people spent most of the night being careful rather than throwing themselves into a typical LNE ceilidh. There were many 'near misses' and at least one couple fell over completely. The dangerous floor received a 'health warning' several times but the stewards seemed to lack the requisite powder with which to treat it. A large Health and Safety Executive notice hung forlornly on one of the walls - a mandatory tin of powder would have been more use! Everyone seemed uplifted by the playing of Sloe (Sloe Benga), a dance tune that often features in the repertoire of the Bismarcks. For some of us, it has become the nostalgic theme tune of Sidmouth 2004 - having been played by Tiger Moth during their LNE appearance and featured on the BBC TV documentary. It is also available on youtube. The chemical toilets (no doubt organised at short notice for Bulverton) were simply appalling. I was told the water for hand washing was replenished daily, but it obviously needed to be done more frequently. The LNE attracts many people who stay in quality hotels in and around Sidmouth - they expect better facilities than were provided. Attendance was in the low hundreds on the first night - (200?) - and this meant that there was plenty of room to dance, an improvement over the "pack 'em in" LNE experience of the Steve Heap years. Yet it felt somehow empty; an extra fifty or hundred people might have made all the difference. As for cost, it was simply too high. Dancing did not start until around 11 pm (so few people came before then) and with an enforced (and too-long) break for tedious entertainment half way through there was probably less than one and a half hours of dancing for � - plus bus fares if you were not camping. I asked one of the few youngsters present what the campsite was like this year. She didn't need any time to compose her reply: "Worse in every way". The Little Johnny England LNE on the Monday night apparently over-ran to 1.30 am, and gave rise to complaints about noise. Subsequent LNEs ended promptly at 1 am. Whapweasel on Thursday night was particularly well attended and with the usual noise level from this band being evident. One local resident who lives in Sidford (and who can remember when the festival consisted of Cyril Tawney singing and a few dancers in Connaught Gardens!) told me she was putting out rubbish at half past midnight and heard them quite clearly. The overriding observation from the LNEs in 2005 is that the whole spirit and special nature of the event have been lost. Numbers were well down (140 being typical with Whapweasel managing well over 600?). Most of the 2005 LNEs simply felt like ordinary ceilidhs - yet with the disadvantage of being held in a cold marquee that was so empty it felt almost lonely. In the Steve Heap years, the marquee was so crowded that if you lost sight of a prospective dance partner you were lucky if you ever saw her again - let alone got close enough to ask her to dance. Entry requirements were 'season ticket holders only' and with rigorous door checks. In 2005, the published entry conditions were 'advance tickets only' - a requirement of the licence conditions. When the small numbers attending became apparent the conditions were rapidly relaxed (or brushed aside?) and door sales were permitted. The books of unsold tickets said it all. The daytime and early evening events held in the Bulverton marquee were an attempt by Gordon Newton to make the most of his expensive facility. Priced at only �or �each they attracted a few people but again the floor often looked empty. For example, the Cajun early evening extra on Wednesday attracted about 140 people but only 30 to 50 on the dance floor. Gross income would have been only (say) 140 x �or �0. The evening was characterised by a level of music so loud it was painful. I asked for the level to be reduced, and it was (a little) but I still spent the time with tissue paper stuck in my ears and not kindly disposed towards so-called sound engineers. Are all of them so deaf they think everyone else is too? A letter I sent to Gordon Newton in the days before the festival suggested that it is about time that festival organisers learned that not all dancers want to attend a simultaneous rock concert at 100dB (sorry about the science, dBs are units used to measure sound intensity on a log scale). Given that Gordon Newton wished very much not to upset the natives of Sidmouth (this was the reason for ending the LNE at 1 am rather than the usual 2 am) I remain surprised by the sound levels at some events. Next year, bring your earplugs. Many people did this year, and it all shows how ridiculous the sound levels have become even at folk events. It is just so unnecessary - and it upsets the natives. The Blackmore Gardens ceilidhs also had their share of problems. On the first night, a popular local group, the Dartmoor Pixie Band, provided their usual quality of very danceable music with caller Sarah Bazeley being on top form. She also provided one of the 'floor spots' that could be a model for breaks at dances - entertainment using simple props and just long enough for people to rest before continuing with the dancing. Organisers who provide tedious, sometimes expensive and too-long breaks could learn a lot from Sarah's solo performance. But what a pity about the floor! Obviously having seen better days and installed on an uneven piece of ground, it was of village fete rather than Sidmouth Festival quality. Large undulations, steeply sloping edges (in places) and a few protruding nails all meant that you could not concentrate solely on the dancing - you had to be careful about where next you might trip up! A stern Health and Safety warning was given by the organisers not to dance in bare feet - as if anyone would be so silly?! Too many of the attendees on the first night simply didn't know how to dance, and some people left muttering that this was hardly Festival material. There was simply no comparison to the Cis Hinkle or Geoff Cubit dances held in the Sidmouth marquees in 2004 - people still talk about them! A major problem seemed to be that so many accomplished dancers simply did not attend Sidmouth in 2005 - and callers can only work with the material they are given. Things improved during the week - the would-be dancers having decided that once was enough. Their plight illustrated one of the principal failings of the whole dance scene at Sidmouth 2005 - the lack of opportunity for 'dip in and out' dancing at various workshops with a range of willing and experienced partners. The Blackmore ceilidhs were simply not for nervous beginners - and neither were any of the other ceilidhs or dances. The Blackmore ceilidh on the Monday night with Grand Union was a sell-out (or it felt like it with 150+ present). It was (so I was told) a better event than Sunday night's LNE that was not well attended - despite Grand Union being the band. Most of the people at Blackmore knew how to dance, many swapped partners during the evening (which always helps) and if it were not for the ever-present threat of spinning off the edge of the sloping floor this would have been about as good as it gets. The band were (predictably) excellent. Subsequent ceilidhs at Blackmore felt much the same - entirely adequate but somehow not really Sidmouth Festival material. Of those I attended, All Blacked Up from Shropshire provided a memorable evening (albeit a little loud) and with Baz Parkes being (as usual) unlike any other caller I know - but it went down well. Total Chaos on Thursday also proved popular but caller Jane Hutton made more than the usual number of mistakes. No-one really minded. Extra entertainment was provided by Great Western organisers banging nails into the floor. They tried their best with it. By the end of the week some of us had developed an 'extra tight' method of swinging that minimised the chances of spinning off the edges. Blackthorn was only moderately well attended on the last night - probably because many people had already gone home - and this was probably little consolation for the abysmal numbers attracted to their Ham afternoon ceilidh. It can't be their music that was at fault - I thought they were very danceable and not too loud - they just seemed to get two of the worst times in the week in which to play, and it was their first time at Sidmouth. Other ceilidh dancers have told me they thought that Blackthorn were one of the best bands on offer during the whole week. Memo to organisers - have them back next year! Afternoon ceilidhs in the Ham marquee. It was such a shame that by far the best dance floor of the festival was so under-utilised. If nothing else, the experiences at the Ham should concentrate effort on what is the central structural problem of Sidmouth Folk Week - the mismatch between what the town can easily provide and what a large dance-oriented festival requires, and the need in 2006 to make better use of expensive bought-in facilities. (See analysis section below). The first afternoon ceilidh (Blackthorn band with Mick Brooks calling) coincided with the first spell of substantial sunshine of the week. Numbers attending were abysmal - a superb dance floor capable of holding hundreds was populated (at its peak) by 16 or 20 people. At one stage, a bemused Mick Brooks had to dance to make up a set. Strangely though, the afternoon proved quite enjoyable, at least for some of us. The absurdity of the situation seemed to generate a cohesion between the few people present and the music was excellent (at least I thought so). Also, there was one 'drop-dead gorgeous' woman in a hippie skirt whose partner was not the least bit interested in dancing. So I thought it my duty to monopolise her company and spin her off her feet a few times. Looks can be deceptive - I would have guessed she would have been an extravert dancer from an early age. At the end of the afternoon she expressed herself a convert, and determined to come to Sidmouth to dance again. It was one of the weaknesses of the organisation in 2005 that this type of person would probably never have tried one of the out-of-town Ray Goodswen workshops (they were too distant and intimidating; once in the door, you could have felt imprisoned) and there was little chance at well attended ceilidhs to learn the basics. The Ham workshops were too specialised for beginners. In the Steve Heap years, the social dances and various workshops could be entered at will (with a season ticket) and you never felt compelled to stay - people were entering and leaving all the time. It was probably the weather that was principally to blame - some people said it was the fact that the ceilidh had been sandwiched between two 'free' ceilidhs at the Anchor pub, but so few of the principal ceilidh dancers go there anyway that the argument does not hold water. The Anchor is populated largely by a few dozen ticket-holding dancers and many local people who dance there (and only there) because it's free. The low number of advance ticket sales for the Blackthorn ceilidh prompted the organisers to schedule a repeat performance by the Reinhardt Project, a gypsy and flamenco inspired group whose guitar concert on Monday afternoon had been greeted with tumultuous applause. The CDs sold out and more had to be flown in from Europe! Yet on the hot and sunny Tuesday afternoon, almost no-one came to hear them play again: their audience consisted mainly of a few exasperated ceilidh dancers one or two of whom stayed on expecting the dancing to restart. In the event, the Reinhardt Project played to 5 pm - it was arguably a better use of a largely empty marquee, but not what we had paid for. The second afternoon ceilidh was Whapweasel on the last day (Friday). This was far better attended if only because in the eyes (or ears?) of many dancers, this band can do no wrong. For my money, they are too loud and I don't much like the music (so why did I buy a ticket??). However, the worst aspect of the afternoon was not the temperature (why can't we have vents in the roof - is it Fire Regulations?) but the simply awful performance of the caller. Here, other people do agree with me - I asked about ten what they thought of her and the answers were universally negative. One group said they would have liked to throw her into one of the scrums she created and trample on her - a little unkind?! Instructions for unusual dances were rattled off at speed and beginners had little chance, save to listen to the more experienced members of their set. Her instructions for the Cornish six hand reel (which most of us knew by heart) were so fast that if I had attempted to follow them I would have been in as much of a mess as some groups were. Even the final dance was poorly called - a circle dance with a partner and then go and find anyone else - a recipe for confusion on a crowded floor when simply 'go on to swing the next person around the circle' would have been more sensible. Some people left muttering, many others no doubt enjoyed it just because it was Whapweasel. But as a dance, I would rate it as the worst of the week. Since this webpage was first published, other people have said much the same. The organisers have admitted there was a mismatch between the band and the caller - adding that the calling needed to be brisk because so many people came primarily to listen to Whapweasel and not to dance. Since when (might I ask) has it been accepted practice to compromise the dance aspect of an event advertised as a ceilidh for the sake of the spectators? These were the one part of Sidmouth 2005 that really felt as if nothing had changed. The infrastructure came free (almost) and this year the ceilidhs were sponsored by the Anchor itself. One day was almost rained off, but on the sunny or simply overcast days, you could have been back in Sidmouth almost any year except 1997 (when it did rain rather a lot..). In any event, the music provided by Spinach for Norman was very danceable and the calling by Pam Hayes was superb - and in a soft Scottish accent that made it especially memorable. Do you really have to get married in order to hear this band?! The usual large number of 'security staff' were on hand - but what for? A more amicable crowd of people would be hard to find. Even when there was some risk to 'health and safety' such as children rock-climbing up the back wall of the venue, they took no action. This must centre around the central problem of Sidmouth - it is a town suited to a small folk festival consisting of lots of small events that can be accommodated in pubs and small halls. It does not lend itself easily to large dances or big-name concerts because it simply has no suitable in-town facilities. Hence, expensive marquees have to be provided and the festival then has to be over a certain size (and preferably with a lot of up-front income) to justify these high fixed infrastructure costs. It needs to be said also that many folkies are entirely happy with a festival centred around the pubs and smaller venues - it is primarily the concert goers and the dancers who require large covered spaces. It is stating the obvious, but once expensive infrastructure is provided it should be fully utilised - for example the Blackmore Gardens marquee should be packed from 9.30 am to at least 10.30 pm and with 'high value' events. In 2005 it was half empty too often. Making full use of the distant Bulverton marquee is more of a challenge because if the weather is bad, people will find something else to do. In the Steve Heap days, people waded through mud ankle deep to get to the LNEs. They were events revered in the whole folk dance world. Those at 2005 could not command especial loyalty. Many local people say that the 'downsized' 2005 festival was better than in earlier years when the town was (in their view) taken over by a commercial company running a festival that had become 'too big for its own good'. Here, it must be remembered that Sidmouth is a small minded town, as well as small. However, if the festival (or folk week) is ever again to become more than a shadow of its former self, it may need to grow from the 2005 size - there may simply be no viable economic size between the small 'in pub' sessions type of festival and the full blown Steve Heap international spectaculars. In 2005 many people attended to keep the spirit of the Steve Heap years alive and to support the organisers who had done so much and (in some cases) risked so much capital. Many of the bands and artistes also came for free or for little more than their expenses - a situation unlikely to be repeated even for the social dances. The plight of the Bulverton LNE venue provides a case study of the assertion that any future festival may need to be over a critical size in order to be viable. Conditions in 2006 may be especially critical for the organisers because (following from 2005) many people may not buy individual tickets in advance, because so many bought in advance and then wished they could change their minds. Thus, advance bookings and 'up-front' money may be a problem unless a full season ticket of equally good value to that offered by Steve Heap can be made available. Here we come to the next major problem : overall, 2005 made a profit of around �,000 and there should be congratulations all round. Some venues (including the LNE) made a loss but a lot of people put in a huge effort, the weather was not unkind and over �,000 was collected in and around the town. This sounds a lot, but it is peanuts compared with the �0,000 it took to run a full Steve Heap festival - the figures are here. Yet this was accomplished only because of ticket prices that everyone thought excessive - so if prices were reduced to a level more in line with the overall value for money offered by Steve Heap, 2005 would probably have made a loss. It is a question of scale with high fixed infrastructure costs. It would be foolish to assume that 2005 could simply be repeated in 2006 and that it would be a similar success. Case study of the LNE. I understand that the LNE venue cost around �,000, mainly for the marquee and other infrastructure. To recoup money over 7 days (and to make some well deserved profit) would require an income of about �00 per day - ignoring bar sales. The early day and evening events (see above) probably yielded only a few thousand pounds in total. If the main income was to be from the � LNE tickets, then upwards of 400 people per night would have been required to attend - yet on many nights it was closer to 150 to 200. Had the venue been full to capacity (800 to 1000?) it would have made a substantial profit. Now that it is so clear that the spirit of the LNE died with the demise of the Steve Heap international scale festivals, the scope for even 150 people per night next year seems bleak. Many people said that the LNE events were 'OK' but not worth the �, and especially not as they ended so prematurely, at 1 am. Also, some ticket sales on the door would not have occurred if the weather had been worse. There is little scope either for making much more use of the Bulverton marquee for social dances. The space was apparently offered 'free of charge' to Ray Goodswen in 2005 but the change of venue to Bulverton all happened too late to change the social dance plans - and in any case so many of that sub-group would never have made it up the hill without a ski-lift! Proper parking facilities for non-campers would have helped a bit, but would have required extra infrastructure and stewarding, neither of which was in prospect. And finally, many concerts at the Ham were both a sell-out and a huge success. But there was considerable annoyance that so many people were constantly walking to and from the bar in the middle of performances. "How rude - you wouldn't do that in a proper concert" was one comment. Maybe the bar should be closed except for one or two interval periods? The prospects for Sidmouth are further analysed on a later page where the facilities of the town are compared with those elsewhere. There is also a risk of good weather impacting on future festivals in Sidmouth.